Now for the main topic at hand today: I'm going to start this post off with a little story. One of my guy friends from high school, T, used to be a teacher aid for a science teacher at our high school last year. Since we were seniors our schedules were a bit more flexible, and since I had a free period while T was in Mrs. N's room I used to go visit him. The first Monday after our prom in May, Mrs. N comes into the room and goes "Finally you kids will have something else to talk about now that prom is over! That's all I've been hearing about for the past few months!" We both laughed, but then I started to realize how true it was. Literally everyday since the start of school after Christmas break the conversation between my friends had something to do with prom. I saw T this past weekend when I was home for Easter break and we laughed again about how so much of our senior year revolved around day dreaming and preparing for this one little night. Since it's "that time of year again," I thought I'd devote a few posts to prom. Today I'll be sharing about what the two proms I went to were like, and next week I'll be sharing some of my favorite prom dresses for the 2013 prom season, as well as my thoughts on the idealization over prom. My junior year I went solo, but as a part of a big group of friends. I actually almost didn't go to prom because I woke up with an allergic reaction and feeling sick (you can read more about that on my old blog in this post), but by afternoon my symptoms had subsided and I felt well enough to go. The weather was terrible though. It was probably in the low 50s, windy, and cloudy. It later started raining once we were at prom. Since I live fairly close to the beach it is common at my high school to take prom pictures at one of the beaches, but my group ended up staying in our friend C's backyard because of the weather. He and his parents put on a lovely pre-prom dinner for everyone and our parents. I definitely saved a lot more money my junior year- and that was a wise decision! I got my dress on sale at JC Penney. I had gotten my shoes for free a few years before at a church yard sale. I did get a corsage and my hair done, but overally I tried to save as much money as possible, because I figured I'd rather splurge for senior prom. 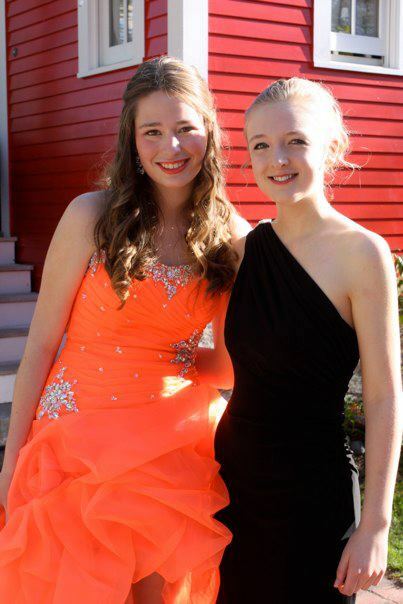 Below are a couple junior prom pictures- one of me and one of me and my sweet friend A! A graduated in the class of 2011 so this was her senior prom. Now fast forward to a year later- senior prom! After an unsuccesful attempt of a guy friend of mine trying to get me a prom date with his friend who went to another school (major FAIL) I decided to take it upon myself to get a date. I asked my friend E from my school's Interact club. We spent much of prom with our friends Jules and K who were also at prom as "just friends," and had a great time dancing with them. My friend H had a bunch of girls over at her house that afternoon to get ready, and then our group's hummer stretch limo came to pick us up and bring us to the beach for pictures! 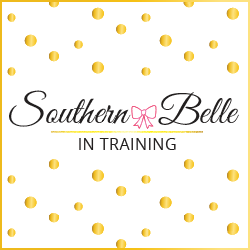 I blogged about the senior prom dress shopping process in this post. It was so much fun! My mom took me a store in Massachusetts called The Ultimate. The whole store is literally just designer prom dresses. If you're a New England girl headed to prom or a special event I'd highly reccomend that you pay them a visit! I never intended on wearing a puffy orange hi-low dress for my senior prom, but after trying on tons and tons and tons of dresses I slipped into my dress and knew it was the one for me! It cost a bit more than I was comfortable with, but my mom said that I could splurge since it was my senior year. :-) The dress was from one of Mori Lee's prom lines- Paprazzi. Also- it is WAY brighter than it looks in these pictures! It's truly a neon orange. A gorgeous dress also required blingy nails and new shoes of course! I got my shoes at DSW- my favorite shoe store. The shoes were blingy and over the top which was perfect. I had acrylic nails done at a local salon. For my hairstyle I decided on big bouncy curls with a half-up, half-down style. And here are my senior prom pictures! Unlike junior prom the weather was absolutely perfect my senior year. 75 degrees, sunny, and no humidity! It was perfect for taking pictures at the beach. Me and Jules! She's one of my best friends from high school. She's in the grade behind me. H (aka "homegurl") and I getting ready to head to the beach! Wearing this dress seriously made me feel like I was an exploding neon colored peach or orange. I was constantly re-arranging my skirt the whole night so I wouldn't trip on myself! And lastly, here's a picture of me and a some friends (and a couple people that I didn't even know that hopped in the picture, lol) at outside our prom venue! 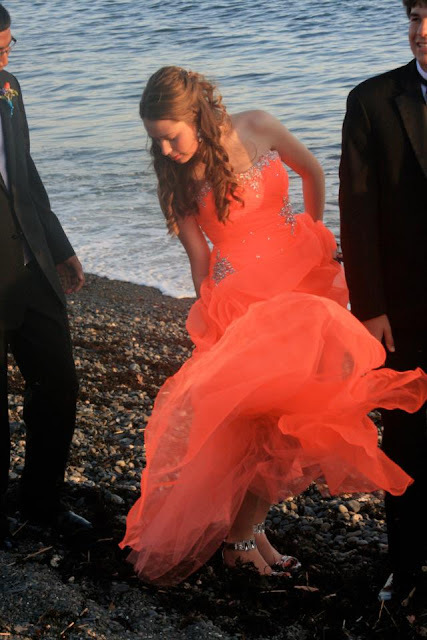 Sorry that the color barely came out in this, but this is like the only accurate picture that shows how bright my dress was. The guy lying on the ground was Jules's date, our goofy friend K. My date, E, is pretending to step on his head here. Good times. Did you go to prom in your high school years? Or if you're in high school, are you going this year? I'd love to hear all about your prom experience! looks like you had a wonderful time, girl! :) being homeschooled, i've never gone to prom, and i don't think i'd really want to. ;) hehe. but you look gorgeous (as usual). i love your prom dress color! I went to my first prom as a freshman, which is pretty uncommon, but I was super close to the junior class at the time. It ended up being a really chill night where we sat outside and just sat in a circle and talked. This year is my first "official" prom and I can't go because my sister is graduating from college- bummer because it's my boyfriend's senior year, but I get to go to my old school's prom so I guess it all balances out. :) I didn't think I'd like your senior prom dress from the verbal description, but my goodness, you looked stunning! Few people can pull off a dress like that, you lucky girl.